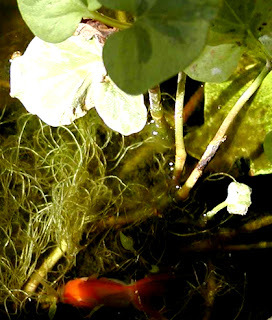 There are two fish who live in the little pond inside the solarium. Two weeks ago, we brought them a friend. His name is Petey. Petey is about 1/10 the size of the other fish, and he pretty much hangs out in one corner of the fishpond where there’s a nice plant for him to hide in. Well, he thinks he’s hiding anyway. This is Petey “hiding” from us. He’s so cute. This entry was posted in Uncategorized and tagged flora and fauna, improvements by Inn on Mill Creek. Bookmark the permalink.